Using data from Nasa’s Interstellar Boundary Explorer (IBEX), scientists have determined the strength and direction of the magnetic field outside the heliosphere, giving us a peek into the magnetic forces that dominate the galaxy beyond. Immediately after its 2008 launch, IBEX spotted a curiosity in a thin slice of space – more particles streamed in through a long, skinny swath in the sky than anywhere else. The origin of the so-called IBEX ribbon was unknown – but its very existence opened doors to observing what lies outside the solar system. 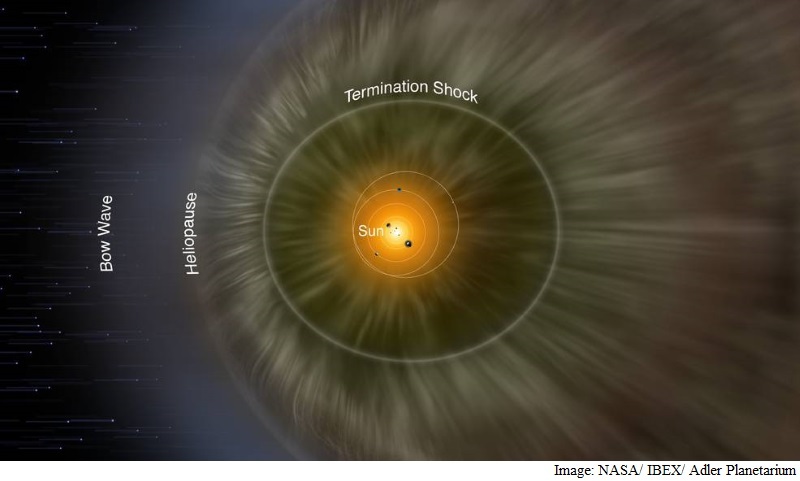 Now, a new study uses IBEX data and simulations of the interstellar boundary – which lies at the very edge of the giant magnetic bubble surrounding our solar system called the heliosphere – to better describe space in our galactic neighbourhood. The study is based on one particular theory of the origin of the IBEX ribbon, in which the particles streaming in from the ribbon are actually solar material reflected back at us after a long journey to the edges of the sun’s magnetic boundaries, researchers said. A giant bubble, known as the heliosphere, exists around the sun and is filled with what is called solar wind, the sun’s constant outflow of ionised gas, known as plasma. When these particles reach the edges of the heliosphere, their motion becomes more complicated, they said. “The theory says that some solar wind protons are sent flying back towards the sun as neutral atoms after a complex series of charge exchanges, creating the IBEX ribbon,” said Eric Zirnstein from Southwest Research Institute in US. “Simulations and IBEX observations pinpoint this process – which takes anywhere from three to six years on average – as the most likely origin of the IBEX ribbon,” said Zirnstein. The directions of different ribbon particles shooting back toward Earth are determined by the characteristics of the interstellar magnetic field. For instance, simulations show that the most energetic particles come from a different region of space than the least energetic particles, which gives clues as to how the interstellar magnetic field interacts with the heliosphere, researchers said. For the study, such observations were used to seed simulations of the ribbon’s origin. Not only do these simulations correctly predict the locations of neutral ribbon particles at different energies, but the deduced interstellar magnetic field agrees with Voyager 1 measurements, the deflection of interstellar neutral gases, and observations of distant polarised starlight. “Voyager 1 crossed the termination shock at 94 astronomical units (AU) from the sun, and Voyager 2 at 84 AU,” said Zirnstein. One AU is equal to about 150 million kilometres, the average distance between Earth and the sun. “That difference of almost 150 million kilometres was mostly explained by a strong, very tilted interstellar magnetic field pushing on the heliosphere,” said Zirnstein. The study was published in Astrophysical Journal.